The Greater Haverhill Chamber of Commerce is pleased to announce a new partnership with the North of Boston CVB to assist in the promotion of Greater Haverhill as an attractive tourism destination to visitors, meeting and convention planners, tour operators and incentive groups. As a result of this new partnership, the Greater Haverhill Chamber is offering the local business community an opportunity to come out for a little networking, refreshments and insight into the effective methods and means to attract to their business the overwhelming number of tourist who visit the North of Boston Region each year. 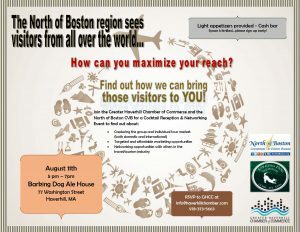 All local business owners and executives are invited to come out and network with the members of North of Boston Convention & Visitors Bureau and other experts in the travel & tourism industry, and find out how to market their business to the Greater Haverhill Region and the world beyond. 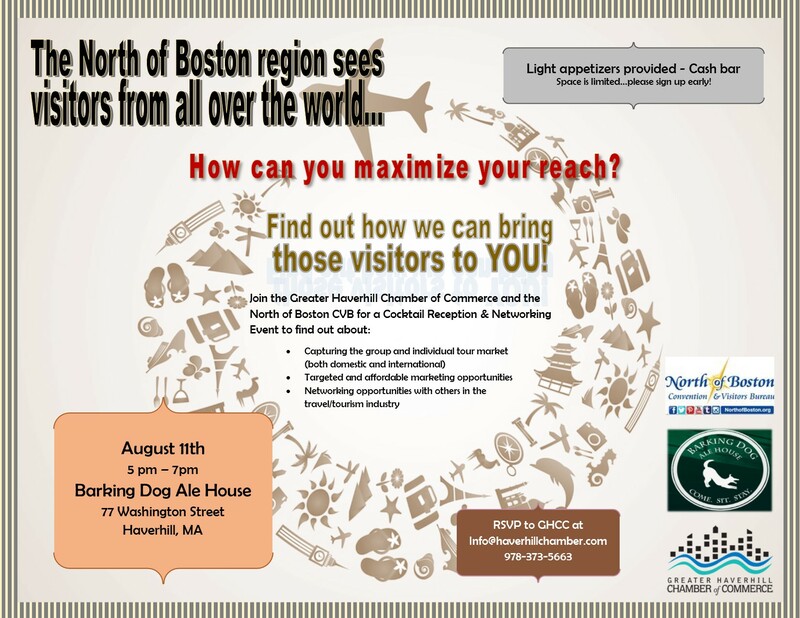 The event will take place on Tuesday, August 11, 2015 from 5 to 7 PM and will be hosted by Barking Dog Ale House, 77 Washington Street, Haverhill. Refreshments will be provided by North of Boston CVB, and a cash bar will be available. All are welcome to attend this FREE event.